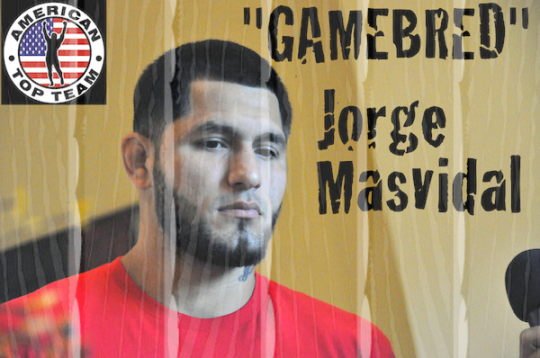 On Dec. 17, 26-year-old American Top Team lightweight Jorge “Gamebred” Masvidal (22-6) will face the fighter widely considered one of the top two or three lightweights in the world, Gilbert “El Nino” Melendez (19-2) for the Strikeforce 155-pound title. It could very well be the final lightweight title fight in Strikeforce history, as there is a high probability the promotion, which was purchased by Zuffa earlier in the year, could dissolve and what is left of the Strikeforce roster could be assimilated into the ranks of the UFC. Isaac Guzman, reporting for ProMMAnow.com (www.prommanow.com) and Fisttacuff Radio, caught up with Masvidal this past weekend in Yuma, Ariz., where he was cornering friend and teammate Alexis Vila (see our exclusive interview with Vila). In addition to talking about Vila’s bout with Marcos Galvao, Masvidal also discussed his upcoming Strikeforce title fight with Melendez and how his training has been coming along. “Gamebred” said he does not even need eight more weeks to train and insists he is ready to go right now. Masvidal shared his thoughts on fighting such a highly-ranked fighter when he himself is not considered among the top 10. However, the former street fighter seems to put little stock in MMA rankings as a whole. If Masvidal is able to get through Melendez, he said he wants “the biggest paycheck he can get, which is obviously in the UFC”.